Here is a collection that neither exploits animals or humans who have to mine for precious minerals or gemstones. 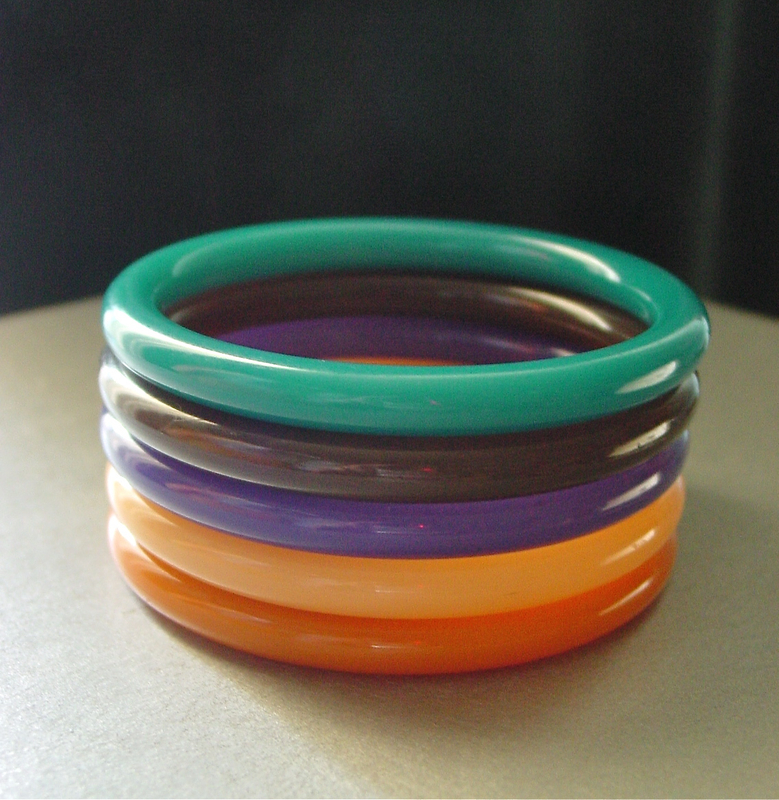 It’s a bunch of nylon bangle bracelets by Ketty Dalsgaard for Buch + Diechmann Denmark. I love the B+D stuff (I’ve posted about my collection of bird brooches before. I also remember that they used to have a store at Queen’s Quay back in the ’80s. Anytime I see anything from this era, I buy it without hesitating. Which is how I ended up with a collection. Hi, my mother had a few bracelets and necklaces by ketty dalsgaard, she bought them in the 70ies, I wear them often and they still look very contemporary and hip, I love them! do you know more about the designer? Unfortunately, this is all the information I’ve been able to find on the internets. I intend to head to the library ond do more research one day. Ketty was my neighbor when I grew up. What do you want to know? I worked at the factory for a few month, asemblying the plastic jewelrie. She Lived about 40 km north of Copenhagen at the cost in the town called Snekkersten just before Helsinore. You can purchase these bracelets, neck rings and clip earrings at jordyb collectibles @ ruby lane….her prices are very reasonable and all are signed Ketty Dalsgaard B&D Denmark.